A poinsettia Christmas Basket can really set the tone for your Christmas table. They are so pretty and the best thing is they last from year to year. 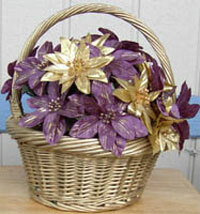 You can also make the baskets to fit any occasion of the year. All you need to do is vary the colors to fit the season. They look great for Valentines Day with red roses and the basket painted white. Another great look is for the Fourth of July. Just make it red white and blue. You can use the traditional red poinsettias or like the one pictured here with gold and bronze petals. It is sometimes nice to be a little different. The gold and bronze colors fits in with a Victorian decor. You can use any colors you like. This basket looks really nice with red flowers and the basket either white of green with a bow. All you need is a basket, floral foam (that you can get at craft stores) and silk poinsettias. If your basket is small then cut the foam to fit. Arrange the flowers so that the design looks full. Another nice design is to paint your basket. Just get the color you like in a spray paint and then spray it. You could really get wild and use more than one color. It all depends on what you want the arrangement to look like. There are also many different traditional flowers that you can use like cyclamen, kalanchoes and even holly will look nice. You can tie a nice bow also on the handle. If the basket doesnâ€™t have a handle make a bow and glue it on the front of the basket. Another idea is to get some fabric and wrap it around the basket. There are many beautiful fabrics for Christmas that would look great for your flowers. You can get one that is a red and green strip that would look really elegant. If you donâ€™t have a basket a clay pot would work just fine. Just remember the ideas are endless. You can come up with some really great ideas by just looking around at different flowers and your own color scheme. This is one of the crafts that is very elegant and easy to make and the Christmas basket looks so nice.